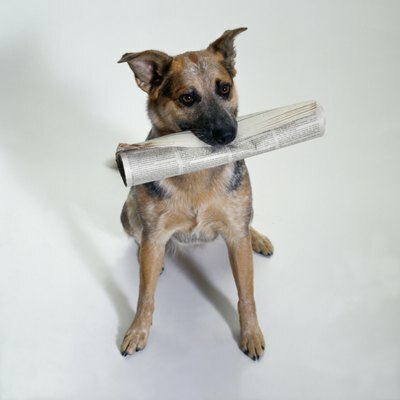 A blue heeler holds a newspaper. The blue heeler is a type of Australian cattle dog. He is intelligent, loyal and protective. The breed derives from the Australian dingo, which was bred with smooth-coated blue-merle collies. The resulting dog was bred with black and tan kelpies and dalmatians to produce blue heeler dogs. The blue heeler is a medium-sized dog, weighing 35 to 45 pounds. He's blue speckled or mottled, often having black or tan markings. The blue heeler has a short, dense double coat that sheds. He is a powerful, muscular dog with wide-set, erect ears. His feet are small and round, with short toes. The blue heeler holds his long tail down and it curves upward. Puppies are born white, a trait inherited from dalmatians. Your blue heeler has strong herding and guarding instincts. The blue heeler forms strong bonds with his family and is protective and affectionate. Suspicious of strangers, he's a courageous guard dog. He's strong-willed and high-energy. Your blue heeler must be well trained or he may chase cars, bicycles and children. He aims to please, but will test his limits. His strong instinct to be dominant requires a firm alpha owner. Early socialization is recommended for your blue heeler. He'll try to herd children and other pets, often nipping at their heels. This is instinct, but can become a problem. If not properly socialized, he may become aggressive. A properly trained and socialized blue heeler is an excellent family dog. He is agile and tireless, loves to run and play with children and is an affectionate, fun-loving companion. A working breed, your blue heeler requires plenty of exercise and mental stimulation. He's not an apartment dog, and simply letting him run in a fenced area isn't enough. Your blue heeler may become a destructive chewer and constant barker if he doesn't get the needed physical and mental exercise, such as herding trials, agility training, jogging and playing with discs and balls. Highly intelligent, blue heelers do well in obedience training. Are Australian Shepherds Hyper Dogs? Why Does an Airdale Terrier Have Extra Fur on The Muzzle?